Someone pressed way too many extra buttons when making this listing. 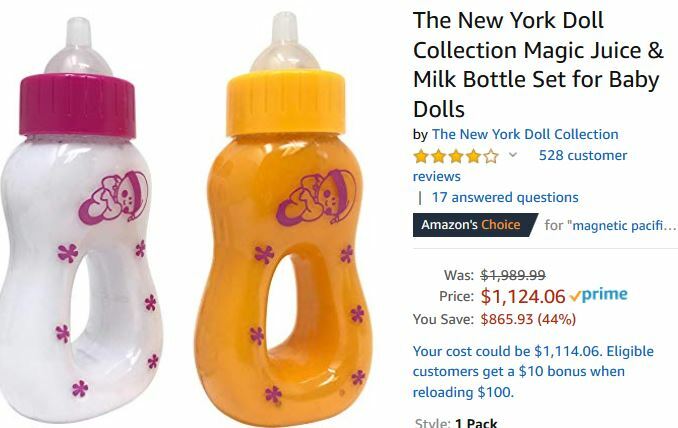 If you’ve got a kid that loves baby dolls, you can get The New York Doll Collection Magic Juice & Milk Bottle Set for Baby Dolls for $1, 124.06. Yes, just a little over $1K and you can have a set of baby bottles similar to what I’ve seen at Dollar Tree. These lightweight plastic bottles are fun to play with and feed your baby. I mean, you’re lucky you caught them on sale – they are $865.93 off regular price! And, oh, happy day, shipping is FREE with Prime! 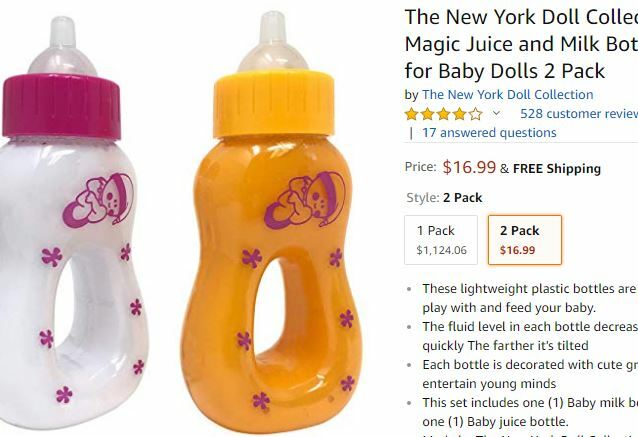 Or, if you really want some “high end toy baby bottles”, best just get the The New York Doll Collection Magic Juice & Milk Bottle Set for Baby Dolls 2 Pack for $16.99. I hope you enjoyed a chuckle. I sure did when I stumbled upon this typo!